We somehow seem unable to get away from tribalism. If you are a member of our tribe, well and good. If you’re not, you have to prove yourself, if that’s even possible. We are all members of tribes of all sorts. Tribes meet deep human needs for bonding and affection. because it emphasizes commonality and is suspicious of differences. Tribal identity is so deeply embedded in human consciousness that when any of us begins to dismantle the walls that separate tribe from tribe, anxiety immediately rises, sometimes to a shocking degree. People who have been taught to feel proud of the tribe they belong to don’t like it when that identity is threatened. We all belong to a great many tribes of different sorts. We’re Americans, and so we’re members of the USA national tribe. We belong to a religious tribe or tribes, a racial tribe, perhaps an ethnic tribe, a tribe of those who do a particular kind of work, a tribe that encompasses people who live in a section of the country, the fans of a sports team, residents of certain state, a particular neighborhood, and so on. All of these things make up the identify of the “I.” As in “I am an American, a Nationals fan, a Southerner, a man.” They don’t, however, have a great deal to do with who we are at our core. Most of those things that we think we are come and go, many are negotiable, some are exchanged rather easily, and none last past death. That is what I think is at stake in the little snippet from Mark’s gospel about the “alien exorcist”[Mark 9:38-40]. It wasn’t what he was doing. It wasn’t about the Name in which he was doing it. The trouble was (for the disciples of Jesus) he wasn’t one of them. 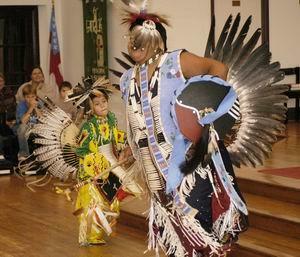 Native American dance being performed in an Episcopal Church. Times have changed since the first century. I remember a comment made by one of my professors forty years ago when I was in seminary. He said, “When the real ecumenical movement comes…” referring to the serious interaction between Christianity and other religions, which had only just begun to gather momentum in those days. 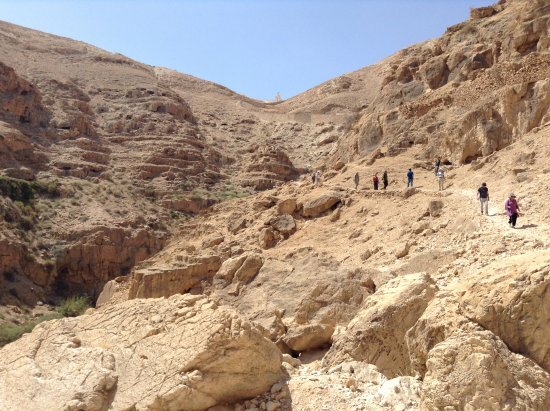 Nowadays, there is enormous interest in the confluence and differences among religious traditions and practices. People gravitate to conversations about religious traditions for all sorts of reasons and with all kinds of agendas. And while such interest is broad, it is still a minority interest. Sometimes conventional Christians find themselves climbing the walls when other traditions seem to be competing with, possibly even altering or, worse yet, displacing the received norms of Christianity. I’m thinking in particular of a General Convention of The Episcopal Church several years ago in which Native Americans played a major role. To its credit, The Episcopal Church has a laudable track record of having brought Christianity to Native Americans without disparaging their own cultures and religious traditions. As a result, there are small but highly significant examples of Native American communities that identify as Episcopal, and who have brought their music, art, dance, food, and symbol systems into the wider Episcopal experience greatly enriching us. Some at General Convention, however, were reportedly scandalized and horrified at what struck them as pagan and certainly as non-Christian. That is not an example that exactly parallels the passage in the gospel about the alien exorcist, but it comes close enough to make the point: somebody is suspect if they appear to belong to a tribe other than ours. Lest you think this is not a matter of some urgency, I want to tell you that my reading of culture these days is that it is imperative that we find as much common ground on which to stand as possible. Otherwise, fragmentation threatens to devolve into enmity and enmity into warfare on a planet that cannot stand much more stress among its human inhabitants. Means of killing whole populations are far too much available for us to imagine that ideological divides are just backwater eddies that can’t have momentous effects. More to the point is who we imagine Jesus to be. I have little notion that in a small slice of a single sermon I can say much that would help you in revisiting your understanding of Jesus. But if I could say only one thing it is that if Jesus is indeed, as Christianity insists, the manifestation of the essence of God, then it is also true, even according to our own scriptures, that the essence of God pops up in every culture, clime, race, nation, and tradition. Jesus the man is or was a particular human being. Christ, however, is the phenomenon that is experienced across lines and boundaries, both in time and in space. I’m saying nothing new here. Hear from the first chapter of the Epistle to the Colossians these words: “He is the image of the invisible God, the firstborn of all creation. For in him all things in heaven and on earth were created, things visible and invisible, whether thrones or dominions or rules or powers—all things have been created through him and for him. He himself is before all things and in him all things hold together.” That is saying something far beyond one human life. It is a claim that what was embodied in this one human being, Jesus of Nazareth, was a universal power that touches and embraces all things. Everything holds together in him. So that is a theological statement, a faith claim. But clearly it is at odds with any attempt to make Jesus the private Savior of a select population. In confessing Jesus’ uniqueness, the Early Church expressly found in him the glue that bonds everything together. As the first chapter of John’s gospel says, “The light that enlightens everyone was coming into the world.” Jesus is not the private possession of a relatively small slice of humanity. One day in about 1977, I opened my mail and saw a flier from a publisher that I didn’t know at all. It advertised a couple of books that caught my eye. 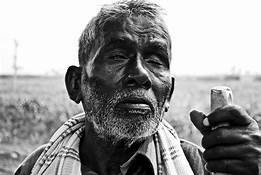 I ordered one entitled Return to the Center by Bede Griffiths, a Roman Catholic Benedictine monk who had at that time lived in India for some time in a Benedictine community styled in the manner of a Hindu ashram. The book turned out to be a brief exploration of similarities of Buddhism and Christianity. Reading it began a new stage in my growth that continues to this day. I have experienced a chain of discoveries of the truth of Christ cropping up in all sorts of places and in unexpected languages. I’ve found Christ showing up in a pagan ceremony of the New Moon, expressed in other language, but acknowledged as old, crippling behavior was denounced and new openness welcomed, much as in Christian baptism. 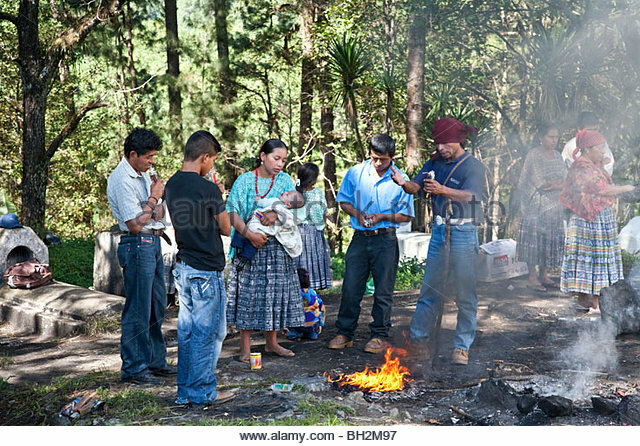 I’ve found Christ showing up as I’ve shivered in a cold Guatemalan forest, warmed by a great bonfire, and have had hands laid on me and prayers offered in the language of indigenous shamans in a Mayan rite, not unlike the healing services that I hold as a Christian priest. The Truth of Christ is universal. That is not to sell short the beautiful particularities of Christian tradition as found in more familiar places, such as your favorite parish church. But the idea is not nor ever has it been how people who attach themselves here or there are better or closer to God than many others. Being a Christian does not mean believing that yours is the only faith or the best. Nor does bearing witness to the power of Jesus mean clobbering other people with a Bible and proving them wrong. 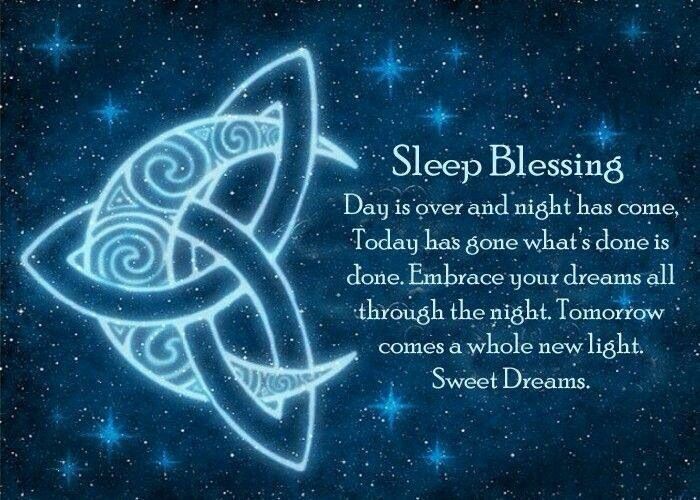 Sleep Blessing from a pagan source. Comparable prayers can be found in Anglican prayer books. Note the Trinitarian symbol in the above graphic. Some people who have looked carefully at the way human consciousness operates have observed that the us-versus-them mentality is inherent in early stages of development. We pass through such stages in our pre-school and elementary school years. If the conditions for growth are present, we learn how to make allowances for others who think and believe differently from us. And if we continue to grow, we get on a path that brings us farther and farther towards the place that we begin seeing that not only we and other humans but also everything in creation actually is a part of a great whole. There is a critical lesson to be learned in Jesus’ response to his disciples’ concern about the alien exorcist. “They who are not against us are for us.” That doesn’t mean that if some are against us we can drop all attempts at respect and reconciliation and proceed to fight back. But neither does it mean that if some are twisting and perverting the Christian faith, as indeed in my opinion is happening on a frightening scale these days, that we have to play nice and not push back. Speaking of that, look at the next sayings of Jesus. What is the point of the gospel if not to reconcile people to each other and all creation with the God who actually manifests in every part of creation? If then we participate in dehumanizing persons, treating them as inferior, ignoring their suffering, disrespecting them no matter who they are, we are betraying and outright denying the very gospel that we affirm by being baptized Christians. Does it not send chills down your spine to hear “if any one causes one of these little ones to stumble, it would be better to have a millstone hung around your neck and be thrown into the depths of the sea?” Does that not ring a bell very clearly to the mass mistreatment of children in the name of the United States? In the name of the Church? And how do we so easily forget that vulnerable children that wring our hearts and move us with compassion grow up to be adolescents and adults who need to be loved and affirmed and fed and clothed and cared for as well? Can our compassion not extend to them? Now you may see why these hyperbolic statements of Jesus that strike us as impossibly hard, even irrational, are meant to shake us out of our lethargy and to call us to full awareness of how necessary it is to grow, to change, to stretch ourselves to live this delightful, joyful, playful life of God that we simply can’t live without giving up our delusions, our enchantments with tribal gods, our fixations on prejudices and pride that separate us from our fellow human beings and cause us to depreciate creation. Is it painful to leave our comfortable positions? It is like cutting off a hand. 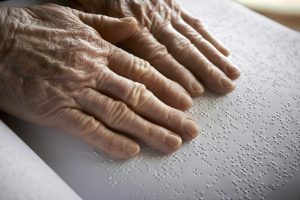 Is it easy to revise our views of reality? It is like plucking out an eye, so hard it is. Is it difficult to learn to love those whom we can’t stand? You bet. It is like cutting off a foot on which we’ve stood for so long we can’t remember, so long that we’ve forgotten that to hate is to stumble and fall, though it masks as if it makes us taller and more powerful. The Christian life is a life of growth. You have every day new opportunities to part with old ways, shed old behavior, get rid of thought patterns that really contribute nothing to your health and happiness, and live differently. It doesn’t happen in a momentary conversion in which you are made pure and perfect. It happens when each day you decide to use your new gift. Salt is good, and you are salt. Yours and my gift is to make life in the world taste better for all. "Salt is good. But if salt loses is saltiness, how can you season it? You are salt." A sermon based on Mark 9:38-50, preached on September 20, 2018, on Proper 21 (Year B) of the Revised Common Lectionary.